Koli Style food interspersed with stories from Thal, a village by the sea and my life as an honorary Parsi. Today is NaraLi Pournima. In Thal most households must have offered coconuts to the sea. My elder uncle and aunt must have prayed for the entire family though our family's livelihood does not depend on the sea anymore. The pooja is to calm down the ferocious sea of the rainy season. They say Agasti Muni's anger causes the sea to be wild in the rains and hence the coconut offering is to appease him. It is said Agasti MavaL la meaning Agasti is now calmed down after this day. NaraLi Pournima marks the beginning of a new year of fishing. It is the day when after 4 months of rest the dolkar (fisherman) gets back to work on the boat. Today is when families are taken for a ride on the decorated boats and singing and dancing is part of the festivities. In the morning the sisters go to the brother's home for Raksha Bandhan. This is the day when the married girls are treated to a delicious meal by their mothers. The sisters give the brothers coconuts and money to buy more coconuts for a game of coconut cracking. The boys go near the Howli (platform where the Holika pooja is performed) to play with coconuts. The game goes like this the coconuts are held in the palm by two boys and banged on each other. It is a great achievement to be able to break a coconut in one shot. The boy who cracks the other person's nut is the winner and gets to keep both the coconuts. Most boys collect the coconuts they won and then hand them over at home to make Chauri chi Karanji. In the evening most mothers boast that they made lot of Karanjis with the coconuts the sons brought home. Coconut cracking was a game I enjoyed a lot. My cousin Digambar was an expert at it and I would accompany him with a big shoppers bag to collect his wins as a kid in Colaba. I would cheer the loudest for him. I would also show to everyone the rakhi I tied on his hand. NaraLi Pournima also reminds me of a rakhis sent by my only aunt for her brothers that we would keep in front of the God and then we girls tied it on our Dad's and uncles wrists muttering Brahma, Vishnu, Mahesh as we tied the three knots. I don't remember anytime my aunt came to visit us on Raksha Bandhan day but she would send the Chauri chya Karanjya (plural) for us after a few days with a message that all the coconuts used for them were my uncle's wins. I made these today for Dad as that is the only thing I could do to celebrate NaraLi Pournima here in Blr. Put the jaggery and coconut together on heat in a thick bottom vessel. Keep stirring till it leaves the sides of the vessel. Put off the heat and add the nuts and spice and mix well. Let it cool completely while we get the dough ready for the cover. Measure out all the items on a counter and make separate heaps. Soak the semolina in the milk for 10 mins. Then mix it along with flour and salt. Knead all the items together then add some oil and knead again. Let it rest for 10 mins. Roll out small rounds and place a spoonful of the chauri on half side fold over the other half to shape it like a crescent. Press the edges to seal. Seal properly as one does not want the stuffing to to come out in oil while frying. Fry the crescents in hot oil on medium heat till nice and golden. Yes we like ours golden! This coconut grater is called Khauni in Koli. Nice recipe. I Will try it soon. Karanjya ekdam sundar disatahet :). Khoop vvarshani Agasti gosht vachali. 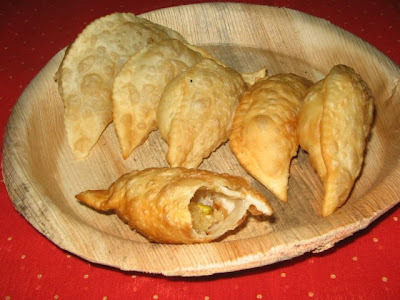 I love it very much its my fav one and we call it soamaas in tamil and we used to make this for diwali festivals. Shriya I learnt a new tamil word! 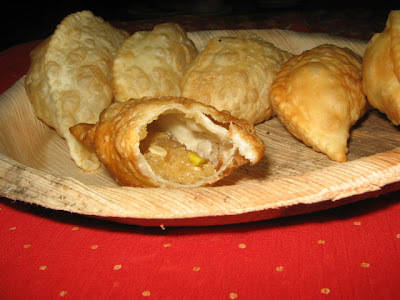 We also make kadboos with a puran filling of chana dal and jaggery; only the pastry is made from wholewheat flour. Eaten in the main course, a hole is duly made in the kadboo, and copious amounts of melted toop is poured in before the big bite. Thank You for taking the time to leave your thoughts here. A Christmas Cheer for Everyone!!
" I AM AN OPTIMIST ! "